These towers are warped, they are crooked, they are interlocking and full of nooks and corners. They are really impossible and, in their impossible reality, shape the image of the new Düsseldorf harbour: the three buildings designed by Frank O. Gehry at the side of the harbour basin, the ‘Neuer Zollhof’, form a unique ensemble – an architectural masterpiece of its own kind. 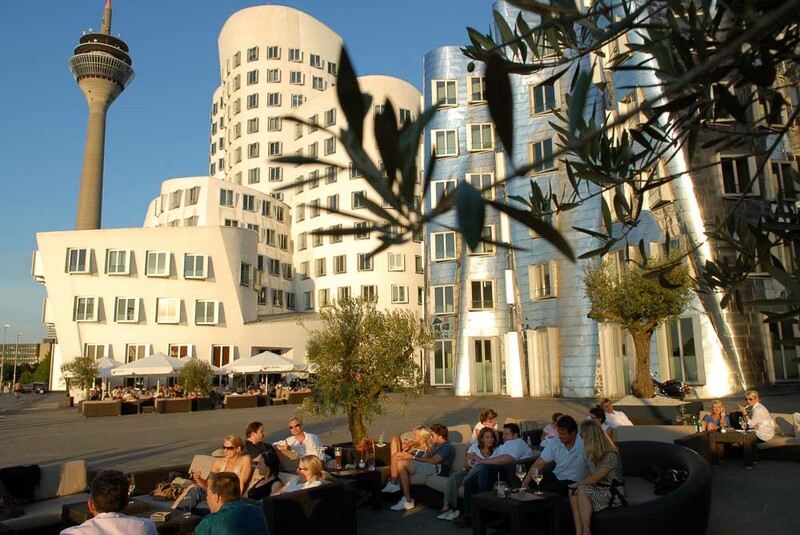 The Gehry buildings, as they are called in Düsseldorf, were completed just before the turn of the millennium and have become the modern landmark of the state capital. Just as the old castle tower a few hundred metres downriver is and will remain the traditional and popular landmark of the former seat of the court. Thus, Frank O. Gehry, Californian superstar in the global world of architecture, has left his unmistakable marks in Düsseldorf. The manifold components of the three buildings give rise to questions and explanations, catch the eye and arouse curiosity, again and again. Gehry’s harbour ensemble has become the one most frequently admired, discussed and photographed building in the city. At a second glance, the eye perceives the strange buildings one after the other, next to each other: similar, and yet absolutely different. Different heights and steps, varying alignments and projections create three solitary buildings that combine to an overall picture. The uniqueness of each tower is especially accented by the choice of material for its outer skin. The first tower is smoothly rendered in pure white, and yet is rather unspectacular next to house B, which is sheathed in silvery shining stainless steel sheets. Their surface, bent all over, reflects the sunlight in endless flashes. And finally, the third tower with the brick facade gives a highly modern aspect to the bizarre architecture. Looking closely at the structural details of the towers, the constructive problems raised by Gehry’s design become evident. Although planned and modelled with a particular view to the outside, the inside of the three buildings had to be functional. The calculations for the supporting walls and floors were done with the help of a specialized computer-aided design programme. The buildings may seem inclined from the outside – their interior is functional and straightforward. Even when the outer walls are slanting, as many right angles as possible are a must for practical purposes. A great deal of cost and expenditure went into the calculation and construction of almost 1600 windows in the three buildings. Gehry’s idea to put each window into a box in order to counteract the different inclinations and angles was fantastically simple – but not that simple to realize. The great variety of shapes of the outer walls required extremely detailed designs. As a result, 1531 individual window boxes had to be designed, manufactured and installed. And there they are. Three unusual, strange buildings, linked with each other. No longer disputed in Düsseldorf and the growing Media Harbour, whose image has become inconceivable without them. Advertising and media agencies have their offices in the Gehry buildings, management consultants and fashion designers work door to door. 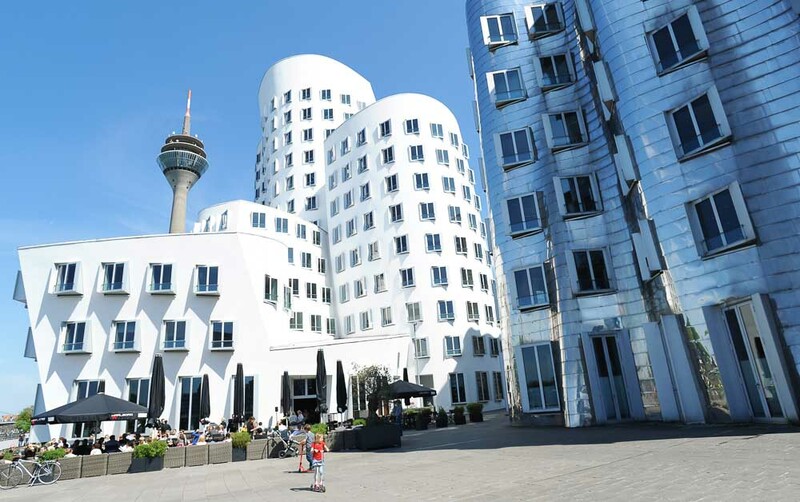 With the Gehry buildings, Düsseldorf’s ‘creative mile’ has found its first milestone. Thomas Rempen, advertising man and Düsseldorfer by choice, has coined this word. Rempen, a cornerstone in Düsseldorf’s creative landscape, had given the initial impulse for fetching Gehry’s architectural sculptures into the Media Harbour. And, as a natural consequence, his agency has taken up quarters behind the inclined walls.